Today, we announced The Future of SharePoint, which detailed our vision, roadmap and significant investments across the user experiences in SharePoint Online. We’re excited by the potential and ability for our customers and professional developers to innovate on these scenarios and drive them to the next level. Our partners, customers and independent developers have created innovative solutions using SharePoint’s Page and Web Part model, which was largely implemented in .NET and, like many content and collaboration systems, was designed and matured in the server-rendered era. SharePoint is evolving to embrace these trends. We are pleased to announce the SharePoint Framework—a Page and Part model that enables fully supported client-side development, easy integration with the Microsoft Graph and support for open source tooling. In fact, we have built the new experiences for our new mobile app, SharePoint Online and OneDrive for Business, including the new document library and list experiences using the SharePoint Framework. We designed the SharePoint Framework to empower SharePoint developers both inside and outside Microsoft. Our engineers are building our modern experiences using the SharePoint Framework. You can use the same technology, tools and techniques we use to build more productive experiences and apps that are responsive and mobile-ready from day one. The SharePoint Framework and its related toolchain helps developers solve the challenges they face today. For example, we recognize people are doing script injection today. Now, with the SharePoint Framework, we have a structured approach to modern app development, end-to-end, that’s not dependent on .NET. We’re enabling you to choose the framework that you want. We’re evolving SharePoint extensibility to meet the needs of our developer community today and opening up opportunities in the cloud that align more closely to what our customers have on-premises. The SharePoint Framework will be available to existing SharePoint sites, and you will be able to host client-side web parts developed with the new SharePoint Framework on existing SharePoint pages. The SharePoint Framework allows you to extend your existing tools and solutions and take advantage of exciting open source opportunities, from project scaffolding with Yeoman to iterative build-test experiences with Gulp and more. The SharePoint Framework adds to the existing, powerful development opportunities with SharePoint—from Full Trust Code on-premises to Office 365 add-ins—to bring a modern client-side approach to enable powerful portal experiences in SharePoint Online. 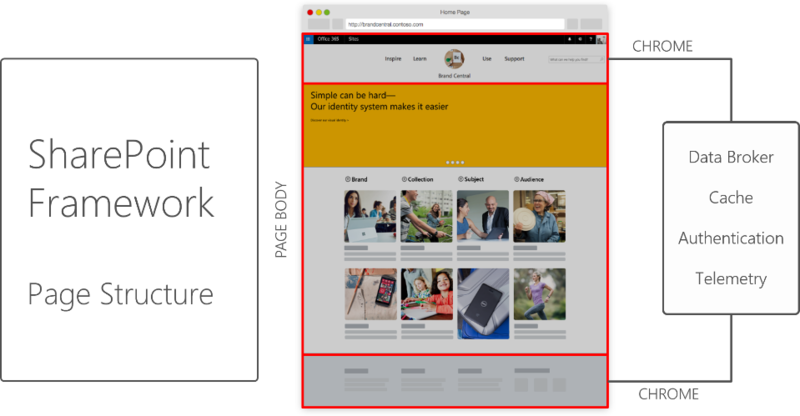 The page structure will allow developers and enthusiasts of all skill levels to extend SharePoint capabilities more efficiently, reliability and faster than ever—and it’s mobile ready and responsive from day one. SharePoint has been the preferred content and collaboration platform in part through its extensibility, and we’re expanding on that extensibility by opening up new opportunities for our developers, whether fluent in SharePoint or just getting started, to build the next generation of solutions with our new rendering framework. We’re excited to innovate in this space and we can’t wait to see some of the new solutions you build through the SharePoint Framework. Over the course of the next several weeks, we’ll continue to update our developers as we advance the SharePoint Framework towards First Release in summer 2016. 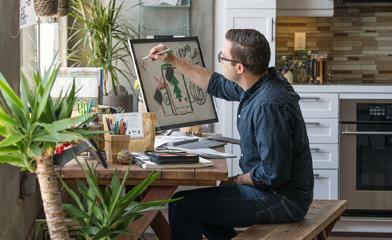 To keep up-to-date with SharePoint and Office development, visit the Office Dev Center. To get started with SharePoint development and connect to the latest training and information for SharePoint development, join the Office 365 Developer Program and learn more about the SharePoint Framework by visiting SharePoint general development. Q. Why is SharePoint introducing the client-side development model? A. With the evolution of Office 365 and cloud SaaS solutions, and the increasingly web-based world, existing development models for SharePoint encounter constraints of the Iframe, a reduced set of APIs and inability to integrate across Office 365 workloads. Developers need a more efficient toolchain and model that allows them to scale beyond the current constraints. The client-side development framework will deliver capabilities that will help Microsoft engineers, partners, customers and developers throughout the community build powerful, rich applications that are both intuitive and simple to consume across browsers, devices and screen sizes. Q. Will new document libraries support customization? A. Yes. When we launch the new document library experience, we will continue to support declarative CustomActions that represent menu and command actions. Many first release customers are currently reporting issues around this functionality; we will address these issues before broad worldwide release of the new experience, or making the new experience the default experience in any library. Solutions that are currently deployed that make use of this mechanism should continue to work as before, with actions appearing in the new command surface in addition to the Ribbon in classic mode. CustomActions that deploy script, JSLinks, and additional web parts on the page are currently not supported. Environments that require these unsupported features should continue using classic mode for the time being. Throughout this year, we will be addressing critical scenario gaps to make the new document library experience support custom processes, commands and other functionality required for complex, business-critical workflows in complex organizations. Specific capabilities we are investigating building include the ability to host web parts on the page, the ability to define custom view layouts and conditional formatting, and the ability to be visually customized and branded with client-side design packages. In the coming weeks, we’ll share additional information surrounding these extensibility opportunities across lists and libraries. Q. When will the SharePoint development framework be available to customers? A. Starting in the third quarter of 2016, we’ll begin to deploy the SharePoint Framework to our First Release customers.